Combining the rolling tunes of ABBA, Cold War tensions, a board game, and an emerging-artist theater sounds odd, even by musical standards. No, this is not some post-modern retooling of Mamma Mia!, but Bootless’ newest production, Chess. 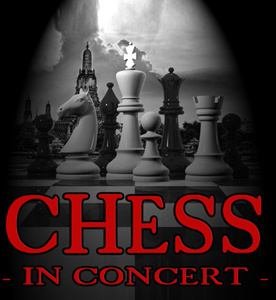 Chess, presented in concert format, tells the fictional story of a romantic triangle between American Chess Grandmaster, Freddie Trumper, Soviet Chess Grandmaster, Anatoly Sergievsky, and Florence Vassy, a woman who manages one and falls in love with another. Underlying these romantic tensions, a more political game is being played between the American and Russian representatives. In a time tinged red, these characters fight for their countries, and their own attempts at happiness. Many audience goers may know ABBA either through their love of 80s music (and there is no shame in that), or their other brief Broadway interlude with Mamma Mia! What most are unaware of is Tim Rice’s involvement in the venture. Best known for productions such as Evita and Jesus Christ Superstar, the lyricist knows his way around his 80s tunes. He levels out the synth with speech like patterns mimicked by principles and chorus alike. Great music. Fantastic. But all of that can be achieved by just purchasing an album. What sets Chess apart – what makes this production, which is essentially about a board game (glorified checkers? ), the cult classic it is today? Chess, on a high level, can get seemingly bogged down with political intrigue. Communism is merely a red herring for the deeper, human, emotions toiling under the surface. The featured orchestra, led by musical director James W. Fuerst, highlights the already frank, and honest, lyrics: everything from heartstring-pulling rock ballads to full choral hymns make an appearance. Speaking of the chorus, the 12 member team heightens the drama – and the stakes – by fleshing out countrymen, spectators, and media-vultures circling the all or nothing game. Chess is one for the books. Not to be missed. An anthem that must be heard, that continues to resound in this time as much as it did in 1986. 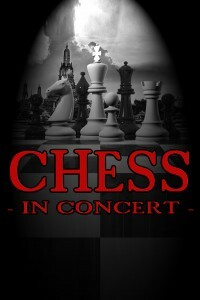 Chess in Concert is presented as Bootless’ Annual Artist Fundraiser. All profits from this event directly support our Artist Fund.